Indiscipline in Painting was an exhibition held at Tate in 2011. I recently started reading the accompanying catalogue. A few artists have jumped out at me, but Knobel is the most interesting at the moment. Knobels assemblages introduce a combination of separate elements into a single form. Disparate elements coming together to form an ambiguous whole. The seemingly everyday, or at least useful, objects make the viewer question whether the works are ‘Art’ or simply a functional pile waiting for their purpose. This halt in moment asks questions of purpose and the apparent careless positioning, which is anything but, alludes to an unknown future purpose. The elements of assemblage can be reformed in different showings, meaning each iteration becomes a new conversation, with the same subject. The work and it's viewers are different at each exhibition, which is a conversation i really appreciate. Knoebel is skilled in composition, in direct counterpoint to the apparent organic placement of the objects. The section on Knoebel in ‘The Indiscipline of Painting’ describes the effect that this care with placement has. “There may be no greater art, his sensibility reminds us, than the fine-tuning and composing of that which looks or sounds completely random, something seemingly without guile or the intervention of the artist. 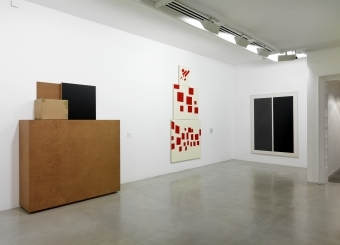 The piece ‘Black square on Buffett’ (1984), consists of a large plain wooden box, small cardboard box, plain wooden board and a black painted wooden board. These four elements together speak about potentiality, function and reference Malevich’s ‘Black Square’. That the black square in Knoebel’s work is leaning on the other elements, and yet the only ‘finished’ piece involved echoes the hierarchy of art, and it's importance. The large wooden box seems to float away from the floor, firmly announcing the intention of the art. When looking at the work it becomes clear that each element has been carefully thought out and considered, and the action of placing the works seems to be evident, in a similar way to a brushstroke containing the action of the painter. Showing the black painted panel next to a smaller, untouched wooden panel alludes to the elevation of status that painting bestows upon the original materials. This piece confronts us with those materials, and others used in the creation of work. I personally find this work extremely appealing, not only for it's concept but the clean lines, angles and careful composition add up to an aesthetically pleasing whole. Clark, M. Shalgosky, S. and Sturgis, D. ed. (2011) The Indiscipline of Painting. London: Tate Publishing. Daniel Sturgis (Undated) The Indiscipline of Painting [Online] Available from: http://www.danielsturgis.co.uk/project.php?id=1 [Accessed - 02/11/17]. Two further weeks into the studio practice and this blog. Making a few paint skins to be used in installation and assemblage experiments. The white cube and grey floor. A large paint skin, made on the floorboards, reflecting the shape of the floor in the form. The white cube is a bit of an obvious reference but nonetheless is aesthetically pleasing. Formula 79 (2017) Assemblage experiments are ongoing. Beginning to experiment with balance.